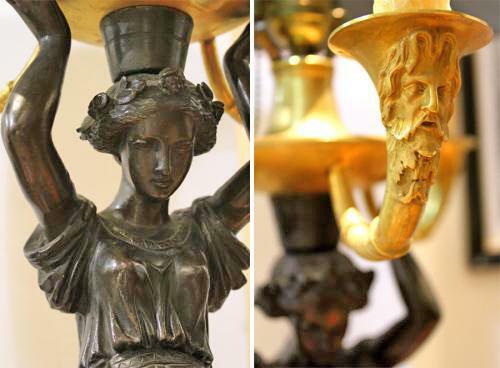 A 19th Century Patinated Bronze Bouillotte Lamp No. 1660 - C. Mariani Antiques, Restoration & Custom, San Francisco, CA. 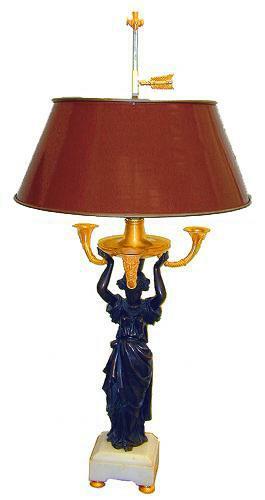 A 19th Century Patinated Bronze Bouillotte Lamp, adjustable red tole shade with three-candle branches held by a female figure raised on a square marble plinth. Height: 34 3/4"; Diameter: 16"